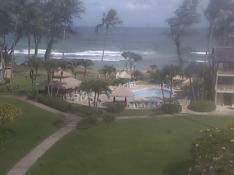 View from Aston Islander on the Beach hotel, located in the east coast of Kauai in the Coconut Plantation Resort area. Weather webcam view from Kapa’a in the island of Kaua’i. View of Bali Hai, across Makai Woods Course, 4th Fairway and 7th Green. There are 8 golf courses in Kauai.